What a lively, crazy, colourful and talented bunch! Let us introduce you to The Dubbeez, a Dutch band of six and winners of the 2016 World Reggae Contest. The prize they won: this release! Their debut album Peace, Love & Dub was produced and recorded by Stephen Stewart and Sam Clayton at Kingston's prestigious Anchor and Tuff Gong Studios. It must have been a hell of a ride for Joanne (vocals), Quincy (vocals), Olivia (bass), Earl (drums), Mills (guitar) and Bobby (keyboards), jumping on a plane to Jamaica with a mission to eternize their songs. And, folks, they did a great job! Ten songs unfold a story of growth and maturity, starting with the sagacious Don't Walk Too Fast, inspired by ambitious young people who are trying to figure out a way to reach their goals. The bass-line was originally played by Patrick Ramdat, the 2015 deceased father of Olivia and Earl. From the frolicking of teenage days in Hangover over first tentative emotions in the flirty Feelings, more serious issues are addressed in Rudeboy. Here, Quincy advices friends, sisters and mothers to let go of dysfunctional relationships. Listen out for a tribute to Dawn Penn! A song about self love and getting to know your purpose in life, I Love Me continues the by now rather grown-up vibe of the release with a message every person should repeat daily, because self-love is one of the most important lessons to learn in life. Instant favourite! In the same vein but more relaxed riddim-wise, Obsession tells us that we shouldn't doggedly try to fit in but be true to ourselves, and Love No More once again encourages emancipation from unhealthy ties. Nothing can stop us, nothing can Hold Us! This song almost sounds like a documentary of the band's development, a journey you can follow via video diary on their social media channels. This leaves us with a grand finale of two songs. The title track Peace, Love & Dub, taken from a long-existant catch-phrase that developed as a motto The Dubbeez live by, is probably the most musically elaborated piece of the album, and the extended instrumental passages as well as an amazing mix make it as representative of their name as a song can be. Six minutes of sweet Dub sensation! Equally long, On The Road closes the parenthesis the first song opened, making the album an obvious dedication to Daddy Patrick Ramdat. The track not only includes a bass-line by him, but also one by Robbie Shakespeare, who visited the recording studio one day to offer Olivia a taste of his craft. 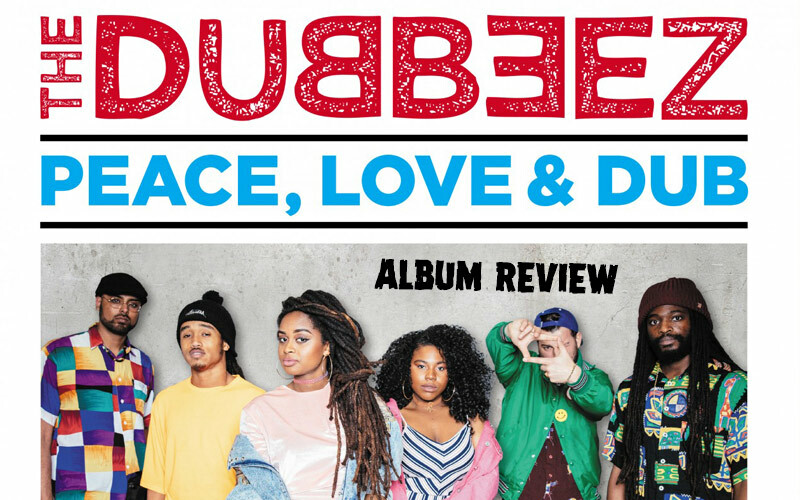 Peace, Love & Dub is a sweet debut that lays a solid foundation the band can build upon – musically dense and lyrically diverse! However, while Joanne maxes out her vocal repertoire, playing with different styles and sounds, Quincy chose a more monotonous approach in his delivery and thus stays a bit behind his potential displayed in tracks like I Love Me. His true vocation is the stage, as anyone who ever saw them perform live will agree. And, in case you haven't had that pleasure yet, check out the tour dates and make sure you catch the energetic show of The Dubbeez!